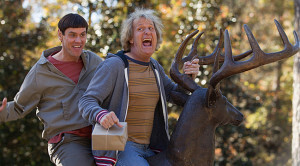 The directorial debut from brothers Peter and Bobby Farrelly, Dumb and Dumber proved to be a box office hit as the film’s misguided main characters Lloyd Christmas (Jim Carrey) and Harry Dunne (Jeff Daniels). The Farrelly brothers resuscitated those characters last year for Dumb and Dumber To, a comedy that catches up with the dimwit buddies some 20 years later. The movie recently came out on DVD and Peter Farrelly called us to discuss it. Talk about making of Dumb and Dumber back in 1994. You made the movie for $17 million and it grossed something like $200 million. Did you have a sense that it was going to become a hit? Well, we thought it was really, really funny. We weren’t surprised when it became a success. On the other hand, you have your fingers crossed. Who the hell knows? It might not connect. That movie took five years to get made. Every studio in town had passed so there’s a little part of you wondering if it’s as good as you think it is. Did you base Lloyd and Harry on real life people? No. The first script that we wrote was called “Dust to Dust.” It was the script that got us in the door. It never got made into a movie. It was about two dumb guys who worked at a down-and-out funeral parlor where they had layaway sales and ran ads like, “Don’t get buried by high prices.” Anyway, the script sold but the movie never got made so years later when we started writing Dumb and Dumber we fell back to similar characters. Talk about casting Jim Carrey and Jeff Daniels. Again, everybody has passed on it. Every studio and every actor — every actor. Years later, I would run into guys who passed on it. They would say, “Hey, why didn’t you ever offer me a movie?” We would say, “Actually, we did offer you Dumb and Dumber but you passed.” It turns out that their agents had passed on it. We were unknowns and no one was reading our scripts. When Jim Carrey came long, somebody told us that the white guy from In Living Color wanted to do it. I said, “Awesome.” I had no idea who it was. I would have taken anybody at that point. All along, we wanted Jeff Daniels in the movie. We were huge Jeff Daniels fans from that movie Something Wild. I found him to be hysterically funny in that movie. I loved the way he could turn on a dime and how goofy he was. When the studio got Jim, they wanted the big comic guys at the time. We said we wanted Jeff. The studio said he wasn’t comedic. We said, “He’s an amazing actor who could do anything.” We convinced Jim to read with him. When Jim read with him, he was in. Jeff was pushing Jim in different directions and making it more real. I believe he’s the most underrated actor alive. There’s nothing that he can’t do. He’s an amazing actor. His personality is different than any role I’ve seen him in. He’s very shy and quiet. You never see him like that but that’s how he really is. He’s a sweet, quite guy. In 2011, you announced that you would make a sequel. What prompted the decision to revisit the concept? It was the only movie we thought we would do a sequel to. The guys don’t grow. They don’t evolve. We left them exactly where we started he first one. We thought we could jump in with another adventure. When we got done with the first one, we didn’t want to go into another one and become the Dumb and Dumber guys. Once you get off the rails with Jim and Jeff everyone is going in different directions. It’s hard to get the band back together, but we pulled it off. Twenty years after the events of the first film, Lloyd Christmas has been committed at a mental institution. That’s where the film begins. What made you think that would be a good way to open the film? We wanted to let everybody know what they’ve been doing for the last 20 years. We sat around for a month or two. At some point, we thought maybe Lloyd had a mental breakdown because of Mary. We started writing it as if he had. At some point, somebody said, “gotcha” and we all howled. We thought it was funny. It was a collaboration with all the writers and it came naturally. What scene was the most difficult to film? The hardest scene to shoot was the train sequence. It was complicated by our standards. Most filmmakers would find it easy. We’re meat-and-potatoes guys. We don’t like CGI. Personally I don’t like the look. It feels like a cheat. I like doing things as real as possible and making the actors do them. In that case, you had to have some CGI because you have a train coming by five feet behind them and knocking a car out of the way. It’s kind of an elaborate set up. It’s one of the scenes I’m most happy with because it turned out so well. The film ends with a poster for Dumb and Dumber For coming Summer 2034. How’s that coming along? We’re in pre-production. I could definitely see doing another Dumb and Dumber. We have a ball with those guys. We don’t want to get right on it. I could see in a few years hopping back into it. That would be fun. Doing a pilot at NBC called Cuckoo. It’s based on a BBC show. I’m doing that and developing a movie script for Ricky Stanicky. We’re in writing mode except for this pilot.